Last year, I wondered what DWSUWF could possibly add to the coverage of the State of the Union when so many other bloggers would be covering the same ground. The answer came from Bob Woodward. I asked Bob in an on-line Washington Post forum whether the SOTU had any real relevance, and he responded it was "mostly theater" (and yes I now feel we are on a first name basis) . Genius. That was the answer. What better way to frame the SOTU, media and blog reactions then than within the lyrics of a show tune? Last year it was "Comedy Tonight" from the play and movie A Funny Thing Happened on the Way to the Forum. This year we have selected the The Seekers 1966 hit "Georgy Girl Boy" from the soundtrack of the movie with the same name [Note: The gender has been modified in this song to fit your blog context]. The game is to find links and references to the lines of the song. I'll post the lyrics before the speech begins, and then update the lyrics with links to live-bloggers, references, analysis and reviews over the next day or so. We already know two topics that will figure prominently in the President's speech. Stimulus - GWB will be using the forum to call on Congress to pass the Economic stimulus bill. This bill is the bipartisan initiative to borrow an additional 150 billion dollars from the Chinese (which will add to the debt burden our children will shoulder) in order to fight the perceived threat of a recession which does not exist yet and probably never will happen with or without the stimulus bill. But it does have bipartisan support from our Congressional representatives who are up for reelection and are falling all over themselves to send checks home to voters in a an election year. So - done deal. FISA - GWB will blame the Democrats for not yet renewing the hastily modified and ill considered version of the FISA Surveillance Bill that simultaneously expanded the power of the government to eavesdrop on Americans, while setting the precedent that it is acceptable for Telecom companies to violate the rule of law when asked by the executive branch to do so. This is a one-two punch that will mange to offend both my libertarian Democrat and libertarian Republican sensibilities. The fact is, both the Stimulus bill and the FISA extension with Telecom Immunity should be stopped. Principled Republicans could stop the Stimulus bill (if you can find them). 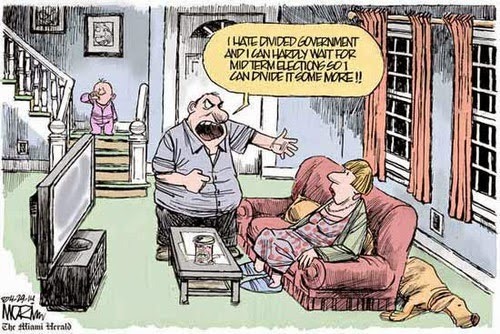 Libertarians and Independents should help them. Principled Democrats could stop the FISA bill as it is presently constituted (Chris Dodd being one and for that we owe him our thanks). Libertarians and independents should help them. And they say gridlock is a bad thing. UPDATED: 29-Jan-08 - Added links, corrected typos. 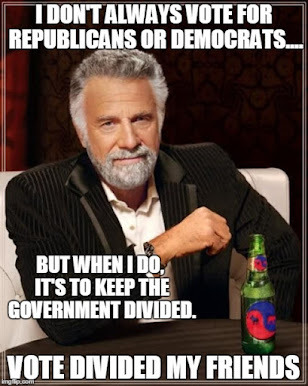 Divided and Balanced™ Now that is fair. Technorati tags: change, 2008 election, State of the Union, SOTU, George Bush , FISA .